You can create your web server certificate and import it using the projector menus and an SD card. Note: You can also register digital certificates from your web browser. Make sure to only register once, or the certificate may not install correctly. 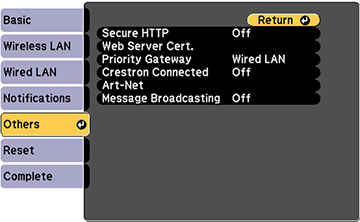 Select the Network menu and press Enter ( ). 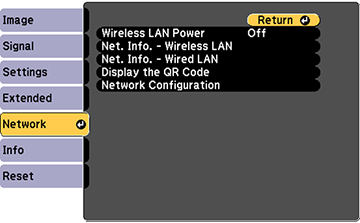 Select the Network Configuration setting and press Enter ( ). Select the Others menu and press Enter ( ). Select On as the Secure HTTP setting. Select the Web Server Cert. setting and press Enter ( ). Select Register and press Enter ( ). Press Enter ( ) to display the certificate list. Select the certificate you want to import from the displayed list. A message is displayed prompting you to enter the password for the certificate. Enter the password and press Enter ( ). The certificate is imported and a completion message appears.